Welcome to the Ambulance Heritage Society home of the UK’s ambulance heritage and archive based in Nottinghamshire, England. Providing ambulances, equipment and expertise from the 1940’s to the 21st Century. Attending community events, film, television, schools, weddings and the final journey of dear colleagues. Founder member Jack Cheetham a Nottinghamshire ambulance man established the Nottinghamshire Ambulance Conservation Group in 1983. Supported by a small group of colleagues, the first project was the complete restoration of a c1950 Austin K8 Welfarer. During 2011 the group saw the addition of an experienced and enthusiastic member and director Malcolm Tomlinson from the West Midlands 205 Conservation Group. 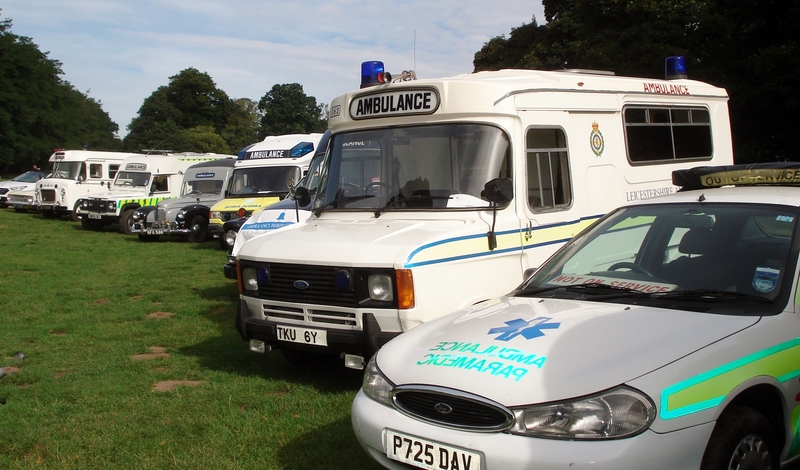 In 2013 the Ambulance Heritage Society achieved a very important milestone by obtaining charity status. The society now have a portfolio of over thirty vehicles, as well as equipment and uniforms to supplement them. Operational and retired staff including interested enthusiasts make our team. Should you have a few hours to spare in helping with fundraising, conservation or events, you will be made very welcome. Please contact a member of the team or send us your details via our contact us page. The AHS are pleased to be working in association with the National Emergency Service museum in Sheffield: emergencymuseum.org.uk.